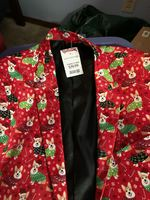 I got my son a red corgi Christmas blazer as a gift (TJ Maxx). Our store only had larges and they are a slim fit. I have tried calling around our stores and no one has it in xl. I also checked the online store and the fb page. If someone is out and sees it, I'd gladly buy it and pay shipping. Or just let me know the store and I'll see if I can get it. Thanks! What does his look like, so we know what to keep our eyes open for? I got my son a red corgi Christmas blazer as a gift. Out store only had larges and they are a slim fit. I have tried calling around our stores and no one has it in xl. I also checked the online store and the fb page. If someone is out and sees it, I'd gladly buy it and pay shipping. Or just let me know the store and I'll see if I can get it. Thanks! Also what store did you get it at, so we can know if we have the same store locally? That seems important! TJ Maxx. Sorry! My head was not in the game apparently. I added a picture to my original post. Thank you for reminding me. I haven't seen that at our TJM, but I'm going Friday so I'll have a look. Can you tell me if it's a child's XL or an adult XL? OMGosh my ds would love that jacket! I'll try and look at our TJMaxx for you, but it is probably too late. I ran into Marshalls and looked. No luck. I should be able to head to TJ Maxx tomorrow. If not, Wednesday. Thanks for trying! I do appreciate it. So sorry - I threw my back out so I didn't get out after my Marshall's run. If I go there this week I will look on the off chance that one is available.